MedReady MR-357FL Free Shipping (Cellular Monitored) | MedReady Inc.
View cart “MedReady 1750FL Free Shipping (Landline Monitored)” has been added to your cart. Prepay monitoring at $16 per month – Pay now or sign up later and pay by the month. Note: You can use this as a standalone non Monitored Device until you are ready start monitoring. SKU: MR-357FL. Categories: Medication Dispensers, Monitored Medication Dispensers. Tags: Dispensers, Pill Dispenser. The MedReady MR-357 series communicates via Cellular Networks to MedReady’s servers. When medication is ready the unit will sound a Buzzer to notify the patient that the medication is ready. Opening the medication door disables the alarm. No land line or internet connection is necessary at the Medication dispenser. The user does not need a cell phone, MedReady uses its own Internal Cellular Device. All medication compliance events and device settings are sent real time via cellular networks. Remotely change alarm times, trigger early doses, and set all device settings from the comfort of your home, or smart phone. 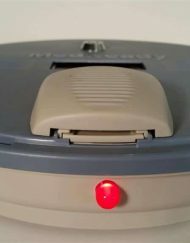 In the case of a medication non-compliance event the dispenser signals MedReady’s servers and then our servers email, send text messages, and place automated phone calls to caregivers alerting them of the non-compliance event. The complete compliance log can be viewed via the compliance website. There is a small monthly monitoring fee. Please call MedReady at 310.328.7557 for more details. This dispenser holds up to 28 doses of medication and can dispense from 1 to 4 times per day. Each dispensing compartment can hold up to 9 M&M size pills. 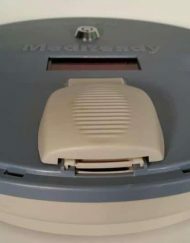 MedReady MR-357FL(Flashing Light) Package comes complete with A/C Adapter, Rechargeable Battery, Medication Tray, Blue Locking Lid, 2 keys, and helpful loading rings for 3x and 4x per day dosing. For our customers in countries other than the United States, our device will work for you too. Note: Many customers choose to purchase 1 or more accessories such as a Combo Tray and Cover for Pre-Filling (5310), or extra keys (6308-K), etc… Please visit the accessories section for a complete list. This has been a lifesaver! Easy to set up and now my mother is taking her meds correctly and on time. This is helping to keep her in her home and more independent! It gives me peace of mind knowing she is taking her correct dosage of meds! Hello, I am so happy to tell you that your product has been fantastic and we are so happy that we found the medication dispenser online. Your MedReady unit came at a time when we were desperate to find a way to be sure my mother-in-law, Nancy, was taking her medications correctly and on time. We got our unit just a few weeks ago. It was easy to set up with clear instructions. We are so happy with being able to receive a notification by phone call and text message as soon as any dosage is missed! Nancy has Alzhiemers disease and recently had a minor stroke, but is still doing well living alone while she enjoys her independence. The number of medications she is on recently increased and became very confusing for her, so your medication dispenser came to our rescue. We’ve shared our experience with the MedReady dispenser with her doctor and his staff. They are thrilled with it too and will be looking for it online. I will send them the website address, they have expressed a big interest in getting the information to other patients. They have asked why they never heard of it. I told them I found it because I was searching to fill a need, and that’s how I found you. THANK YOU a thousand times over and over! I think you should send business cards or hand-out materials to doctor’s offices all over so they can share with patients! UPS delivered the MedReady broken and so I called MedReady and they had a replacement to me in 2 days with a return label. The activation process took 5 minutes and I was up and going. They walked me through it on the phone with patience but after I was done I realized I didn’t need their help because it was so easy to set up. Just like a digital alarm clock. 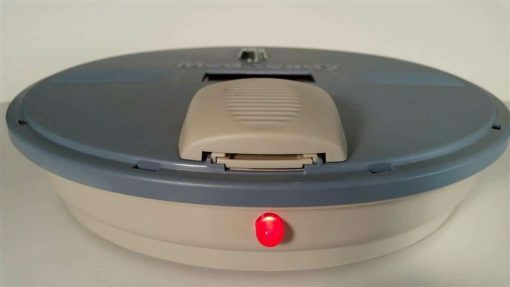 My mom is forgetful and we used to argue about her meds all the time, now all she wants to talk about is how well this device works. When I call, she’s amazed how I know that she did not take her meds. I think she misses them on purpose so I call her and talk. Great product, and I like that it is made in the USA with domestic customer support too. Works really well to help give my father his meds since he had a stroke. Real time monitoring lets me stay on top of it. Did not need a landline because of the cellular module inside.